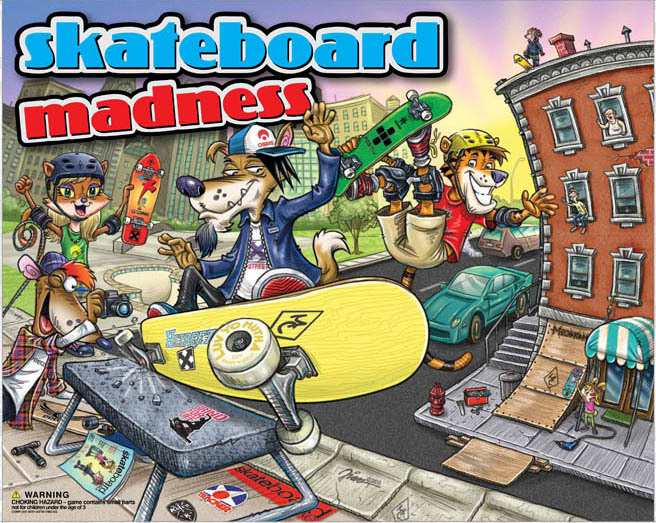 Heres an Illustration I did for a game board box cover for wonderful folks at Mindtwister. I also did character art that will be on game pieces and various pieces of art for other aspects of the game. It should be out in stores hopefully this spring. What a great project to work on. Being a skateboarder its very rare I get to combine my passion for art and skateboarding in one shot. The characters (which I will post soon) were really fun to create, they reflect different personality types in the world of skateboarding. Working closely with Tony Mag (skateboarding legend and owner of Mindtwister) has been a real blessing! One of the coolest guys I've had the pleasure to work with and get to know...period! In the process of creating art with Tony for a dice game with a fantasy theme...dragon,knights and wizards...AWESOME! I will post the sketch for the cover next week...so stay tuned. I have this wicked chest cold. I've lost my voice....bummer!